PAKISTAN in Central Asia is a prominent Muslim country, has a population of about 170 millions people (05/2007) and covers 804,000 km. 77% are Sunnites, 19% are Shiites and the rest Christians and others. The country stretches from India in the East, the INDIAN Ocean in the South, Iran and Afghanistan in the West and China in the North. PAKISTAN as a separate political identity was created in 1947 when the British, before leaving India, decided to divide the territories under British domain to two countries, a Muslim – PAKISTAN including the eastern district of Bangladesh and a mainly Hindu India. Ever since 1947 PAKISTAN and India are engaged in a bitter ongoing struggle over Kashmir, that was divided by the British, temporarily, between PAKISTAN and India. That confrontation caused 3 wars between the two countries and after the last war in 1971 Bangladesh in the East became an independent state. PAKISTAN is a mix of ethnic and religious groups and languages: about 48% are speaking Punjabi and the rest 5 other languages and numberless dialects. Large areas in PAKISTAN are ungoverned by the central regime but by local tribe leaders in coexistence with the official authorities. PAKISTAN is a very poor and undeveloped country that suffers from internal violence between ethnic and religious groups. The war against the Russian Soviets in the 80ies, in the neighbor Afghanistan, was supported by most of PAKISTAN society that shares the same ethnic origin and beliefs. ISI became the coordinator and mediator between the Afghanistan factions and the CIA and together, ISI and CIA cooperated in recruiting volunteers to the war in Afghanistan from all the Muslim world in the name of Jihad. After the Russian left Afghanistan in 1989 PAKISTAN and ISI ceased the opportunity to channel the enthusiasm of the Moujahidin in Afghanistan to the terror campaign against India in Kashmir. With the support of ISI the struggle in Kashmir changed form to an ongoing terror campaign of the Muslims in Kashmir against INDIAN army and Hindus civilian. The spirit of Jihad permeates into the PAKISTANi society and provoked also internal violence between Shiite and Sunnite. PAKISTAN is suffering from frequent terror suicide attacks of rival groups against each other. 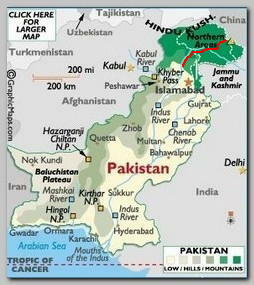 Today (05/2007) PAKISTAN is a non-democratic nuclear power with an unstable regime and an extreme Muslim population. PAKISTAN is, probably, one of the most dangerous countries in the world in the prospect that the Global Jihad can obtain nuclear weapon.